Nanuet, NY – After tasting his first slider at the age of five, Peter Bevilacqua turned his love of White Castle into a tradition. For 57 years, he celebrated his birthday at a Castle in New York, where he developed a family-like relationship with the restaurant’s team members. Bevilacqua recently passed away but his never-ending love of sliders and deep roots at the Nanuet White Castle have landed him in the Cravers Hall of Fame. 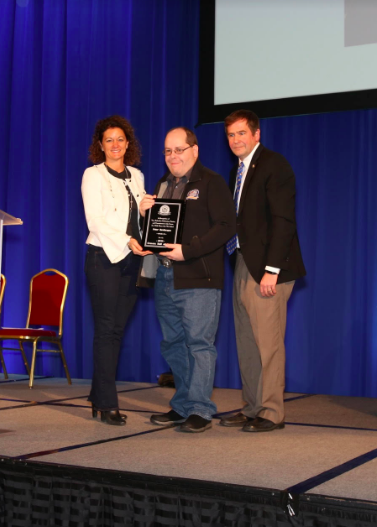 Bevilacqua was formally inducted into the Cravers Hall of Fame on Feb. 19 at a special White Castle ceremony in the restaurant chain’s hometown of Columbus, OH. As one of 12 “Cravers” from across the country to be included in the 2018 class, he was recognized for a lifetime of traditions at White Castle and for always providing a friendly face to team members. Bevilacqua had an unrelenting love for White Castle and visited the Castle in Nanuet four to five times a week before his passing. He was represented by Lombardi at the induction ceremony to accept the honor. White Castle launched the Cravers Hall of Fame in 2001 to celebrate and honor its most loyal fans. The judges evaluate submissions based on brand loyalty, creative presentation, originality and magnitude of the Crave. Nearly 250 White Castle fans have received this distinguished award since 2001. In 2002, White Castle added the “Craver in Extremis” category to recognize public figures, celebrities and pop icons; including Alice Cooper, Kal Penn and John Cho, Telfar Clemens, Anthony “Spice” Adams and the late Stan Lee, who have all publicly shown their love of White Castle.